Born in Pittsburgh on January 6, 1830 and the son of James Lambdin. In the late 1830’s his family moved to Philadelphia and by 1849 George was exhibiting his first works at the Pennsylvania Academy of the Fine Arts. In 1850 the family move to Germantown, just north of Philadelphia, and it was here that they would remain. George traveled to Europe to continue his studies during the mid 1850’s and was back in America by 1856. Early on he specialized in genre scenes, which displayed an influence from the great Dutch artists of the 17th and 18th centuries. Among these works are: Our Sweet Songs are Those that Tell of Saddest Thought (1857); Clasping a Bracelet (1857); The Bashful Model (1862); A Stolen Lily (1864); and Small Pets (1867). Lambdin also derived inspiration from the Civil War for numerous military works that were executed during the 1860’s. Among his more notable paintings were The Consecration (1861); Weary, Tiresome Winter Quarters – Culpeper CO., VA (1864) and At the Front (1866). The Consecration was sent to Paris in 1867 to be exhibited at the Universal Exposition. In the late 1860’s, George moved to New York City and took up residence at the Tenth Street Studio Building. Among the artists he would have met were Seymour J. 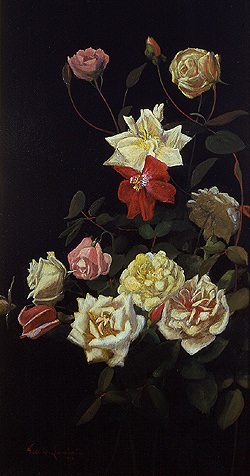 Guy, John G. Brown, Winslow Homer, Eastman Johnson and John LaFarge, the renowned still life painter (it was this friendship, that many believe, would soon inspire Lambdin to devote his later life to the study and depiction of flowers). During his time in New York, he must have achieved a certain amount of success as he was elected an Academician at the National Academy in 1868 and exhibited a number of works their during this period. In 1870, he and his brother took a short trip to Europe – traveling through the Continent and spending a good deal of time in England. Upon their return, George’s interest in genre painting began to wane and he became fascinated with flowers. Philadelphia, and more specifically Germantown, was a center of horticultural activity during the 19th century and a number of famous nurseries were founded there. 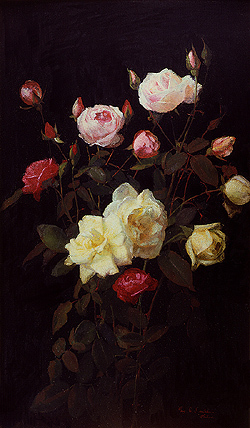 The ability to find suitable subject matter was easy and it was Lambdi n’s realistic and sophisticated flower paintings of this period that earned him his deserved fame and popularity. 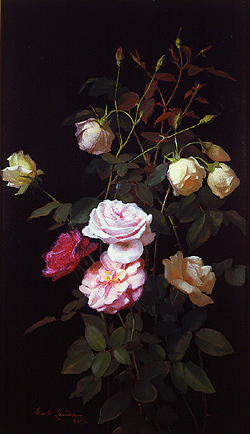 These floral works fall into distinct groups: the more typical depiction of flowers in a vase, flowers captured in a natural setting, and his now famous, and unique, images featuring flowers against a black, or solid dark, background. 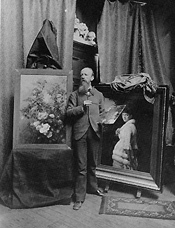 Lambdin remained an active member in both horticultural and artistic circles until the end of his life in 1896. Yale University Art Gallery, CT.